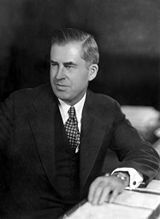 Henry Agard Wallace (October 7, 1888 – November 18, 1965) was the thirty-third Vice President of the United States (1941–1945), the eleventh Secretary of Agriculture (1933–1940), and the tenth Secretary of Commerce (1945–46). In the 1948 presidential election, Wallace was the nominee of the left-wing Progressive Party, campaigning as a critic of Harry S. Truman's policy of opposition to Soviet expansionism, an attitude he later admitted was mistaken. In 1933, he was appointed Secretary of Agriculture in the Cabinet of President Franklin D. Roosevelt and served until September 1940, when he resigned after being nominated as Roosevelt's running mate. In November 1940, he was elected as Vice President on the Democratic ticket and was inaugurated January 20, 1941, for the term ending January 20, 1945. An unsuccessful candidate for renomination in 1944, Wallace was appointed Secretary of Commerce and served from March 1945 to September 1946. Wallace is generally remembered for his naive support of the Soviet Union during the post World War II era, culminating in his run for the presidency on the Progressive ticket. Wallace was born on a farm near Orient, Iowa, and graduated from Iowa State College at Ames in 1910, where he was a member of the Delta Tau Delta fraternity. His father was Henry Cantwell Wallace. He worked on the editorial staff of Wallace's Farmer in Des Moines, Iowa, from 1910 to 1924 and edited the publication from 1924 to 1929. He experimented with breeding high-yielding strains of corn (maize), and authored many publications on agriculture. In 1915 he devised the first corn-hog ratio charts indicating the probable course of markets. With a small inheritance that had been left to his wife, the former Ilo Browne, whom he married in 1914, Wallace founded Hi-Bred Corn, which later became Pioneer Hi-Bred, a major agriculture corporation. Wallace was raised as a Presbyterian, but left that denomination early in life. He spent most of his early life exploring other religious faiths and traditions. For many years, he had been closely associated with the Russian theosophist Nicholas Roerich. According to biographer Arthur Schlesinger, Jr., "Wallace did Roerich a number of favors, including sending him on an expedition to Central Asia presumably to collect drought-resistant grasses. In due course, H.A. [Wallace] became disillusioned with Roerich and turned almost viciously against him." Wallace eventually settled on Episcopalianism. In 1933, President Franklin Delano Roosevelt appointed Wallace United States Secretary of Agriculture in his Cabinet, a post his father, Henry Cantwell Wallace, had occupied from 1921 to 1924. Wallace had been a liberal Republican, but he supported Roosevelt's New Deal and soon switched to the Democratic Party. Wallace served as Secretary of Agriculture until September 1940, when he resigned, having been nominated for Vice President as Roosevelt's running mate in the 1940 presidential election. During the 1940 presidential election, a scandal about Wallace's spiritual associations nearly erupted. A series of letters that Wallace had written in the 1930s to the Russian mystic Nicholas Roerich was uncovered by the Republicans. Wallace addressed Roerich as "Dear Guru" and signed all of the letters as "G" for Galahad, the name Roerich had assigned him. Wallace assured Roerich that he awaited "the breaking of the New Day" when the people of "Northern Shambhalla"—a Buddhist term roughly equivalent to the kingdom of heaven—would create an era of peace and plenty. When asked about the letters, Wallace lied and dismissed them as forgeries. When the Republicans threatened to reveal his beliefs, the Democrats countered that they would release information about Republican candidate Wendell Willkie's extramarital affair. Wallace was elected in November 1940 as Vice President on the Democratic Party ticket with President Franklin D. Roosevelt. His inauguration took place on January 20, 1941, for the term ending January 20, 1945. Roosevelt named Wallace chairman of the Board of Economic Warfare (BEW) and of the Supply Priorities and Allocations Board (SPAB) in 1941. Both positions became important with the United States entry into World War II. As he began to flex his new-found political muscle in his position with SPAB, Wallace came up against the conservative wing of the Democratic Party in the form of Jesse H. Jones, Secretary of Commerce, who differed with him on how to handle wartime supplies. On May 8, 1942, Wallace delivered his most famous speech, which became known by the phrase "Century of the Common Man," to the Free World Association in New York City. This speech, grounded in Christian references, laid out a positive vision for the war beyond the simple defeat of the Nazis. The speech, and the book of the same name which appeared the following year, proved quite popular. However, they also earned him enemies among the Democratic leadership, important allied leaders like Winston Churchill, and business leaders and conservatives. Wallace spoke out during race riots in Detroit in 1943, declaring that the nation could not "fight to crush Nazi brutality abroad and condone race riots at home." In the same year, Wallace made a goodwill tour of Latin America, shoring up support among important allies. His trip proved a success and helped persuade 12 countries to declare war on Nazi Germany. However, regarding trade relationships with Latin America, Wallace ran into trouble when he influenced the Board of Economic Warfare to add "labor clauses" to contracts with Latin American producers. These clauses not only required producers to pay fair wages and provide safe working conditions for their employees, but also committed the United States to pay for up to half of the required improvements. This met stiff opposition from the U.S. Department of Commerce. Wallace feuded publicly with Jesse Jones and other high officials, and was now seen as a political liability. Roosevelt stripped him of all responsibilities and made it clear Wallace would not be on the ticket again. The Democratic Party, with concern being expressed privately about Roosevelt being able to make it through another term, chose Harry S. Truman as his running mate at its convention. Roosevelt placated Wallace by appointing him Secretary of Commerce. Wallace served in this post from March 1945 to September 1946. He was fired by President Harry S. Truman because of disagreements about policy towards the Soviet Union, with Wallace maintaining that the Soviets should be trusted and treated as allies rather than adversaries. Following his term as Secretary of Commerce, Wallace became the editor of The New Republic magazine, using his position to criticize vociferously Truman's foreign policy. On the declaration of the Truman Doctrine in 1947, he predicted it would mark the beginning of "a century of fear." Wallace left his editorship position in 1948 to make an unsuccessful run as a Progressive Party candidate in the 1948 U.S. presidential election. He strongly opposed the Truman Doctrine's assumption that the Soviet Union constituted a threat to American national security and advocated going farther that the New Deal had done in instituting socialist-style economic reforms, including socialized medicine. His platform also advocated an end to segregation and full voting rights for blacks. The campaign was unusual for his time in that it included African American candidates campaigning alongside white candidates in the American South, and that during the campaign he refused to appear before segregated audiences or eat or stay in segregated establishments. Wallace suffered a decisive defeat to the victorious President Truman. Gaining only 2.4 percent of the popular vote, he ended up third runner-up behind Republican Thomas Dewey and Dixiecrat Strom Thurmond. Wallace resumed his farming interests, and resided in South Salem, New York. During his later years he made a number of advances in the field of agricultural science. His many accomplishments included a breed of chicken that at one point accounted for the overwhelming majority of all egg-laying chickens sold across the globe. 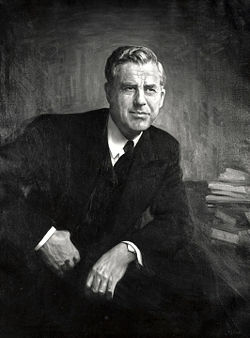 The Henry A. Wallace Beltsville Agricultural Research Center, in Beltsville, Maryland, the largest agricultural research complex in the world, is named for him. In 1950, when North Korea invaded South Korea, Wallace broke with the Progressives and backed the United States-led war effort in the Korean War. In 1961, President elect John F. Kennedy invited him to his inauguration ceremony, though he had supported Kennedy's opponent, Richard Nixon. He died in 1965 of Lou Gehrig's disease in Danbury, Connecticut. His remains were cremated at Grace Cemetery in Bridgeport, Connecticut, and the ashes interred in Glendale Cemetery, Des Moines, Iowa. Along with his experimentations on breeding high-yielding strains of corn (maize) and authoring a number of publications on agriculture, Wallace devised in 1915 the first corn-hog ratio charts indicating the probable course of markets. He also left a remarkable legacy of public service: thirty-third Vice President of the United States (1941–1945); the eleventh Secretary of Agriculture (1933–1940); and the tenth Secretary of Commerce (1945–1946). Despite these accomplishments, Wallace is remembered for his naive support of the Soviet Union during the post World War II era, culminating in his run for the presidency on the Progressive ticket. Yet in his later years, Wallace made an effort to salvage his legacy. In 1952, he published Where I Was Wrong, in which he explained that his acceptance of the Soviet Union and Stalin stemmed from limited information about Stalin's excesses and that he, too, now considered himself an anti-Communist. To this end, he wrote informative letters to "people who he thought had traduced him" and advocated the re-election of President Dwight D. Eisenhower in 1956. ↑ Henry A. Wallace, Adherents.com. Retrieved April 28, 2008. History of "Henry A. Wallace"
This page was last modified on 15 December 2017, at 15:35.